Mount Amos is a personal favourite over at TasTrails. Offering an unmatched view of Wineglass Bay it is a must for any adventurous bushwalker heading to Freycinet National Park. The walk itself is short, demanding and extremely entertaining. The rock face sections in particular offer a steep and slippery challenge. In total the walk should take roughly 3 hours return but we recommending giving yourself at least an hour to enjoy one of the most majestic view in Tasmania at the top. View Google Map Directions Freycinet National Park is 195km from Hobart and roughly 3 hours drive. From Hobart take the Tasman Highway (A3) through Sorell and continue up the East Coast. This highway takes you the majority of the way until you reach the turn off to Coles Bay Road (C302) 12km before Bicheno. Continue for another 20km, passing through the township of Coles Bay to reach Freycinet National Park. The Mount Amos walks from the main carpark. Beginning at the Freycinet National Park carpark the track heads directly inland along a well paved gravel track; this first section of the walk is easy going with only a slight uphill incline. After 1km the track opens up to steeper rocky hiking as you start to emerge from above the main tree line. From here the track continues to become rockier and less dependent on a well-defined ‘track’. Soon many sections of the walk require the scaling of large granite rock faces, which can be quite tricky to master at first, though most walkers soon find their feet and enjoy the challenge this uncommon hike style offers. As you scramble your way up Mount Amos you’re constantly bombarded with glimpses of its beauty. The initial views from Mount Amos hike are fantastic, you will find yourself making many excuses to stop and soak in the beauty. Walkers also share this area with many frogs, lizards, birds and wallabies which are commonly seen along the track. The last segment of the walk evens out into a less demanding climb which approaches the summit. Once at the top all the hard work, scraps, sweat and swearwords will soon be rewarded with a panoramic view of all of Freycinet, including a view of Wineglass Bay unmatched by any other location in the park. In total the walking time required will be around 3 hours, although this depends on how slippery and busy the track is. I thoroughly recommend this walk over the Wineglass Lookout Walk in summer as crowds will be significantly fewer. 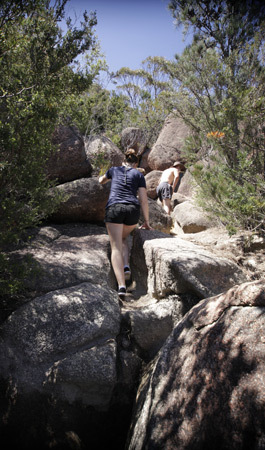 There are many slippery and steep rock faces within this walk, be sure to wear suitable bush walking shoes. The summit is quite exposed and weather can quickly change, so pack accordingly. Steep section of the track.